Hello, and welcome back to the West Texas Windshield blog. Fall is finally arriving here in West Texas, which means a new set of demands may be placed on your car. While you probably spent a lot of the summer using your vehicle to take road trips, packing it full of camping gear for a weekend getaway, or driving your Toyota Pickup to rip around on the trails in Texas hill country, your car could most likely use some attention. It’s good practice to routinely check your vehicle with each new season to prepare for whatever weather or uses may come up in those months. 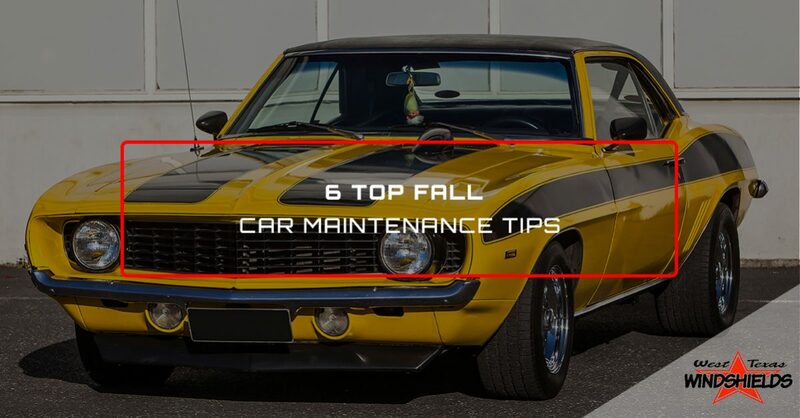 Today, we will explore some of the best ways to get your vehicle prepared and ready for fall. Please continue reading below to learn more. October weather here in San Angelo can be somewhat erratic, but for the most part, thunderstorms and cold fronts are characteristic for this time of year. Therefore, you’ll want to have reliable wiper blades to wipe away the rain and mud splashes from your windshield. If you replaced your wiper blades at the start of summer, you can probably get a few more months out of them; however, if you replaced them back in the spring, it’s definitely time to update your blades. A good rule of thumb is to replace your wiper blades every six months unless they appear to be damaged, frayed, or consistently leave streaks on your windshield. Rain-X makes great wiper blades that are both cost-effective and durable. Also, make sure to top off your wiper fluid. If you took a lot of road trips this past summer, chances are you may be due for a tire rotation. Inspect your tires for signs of wear and tear, and check the tire pressure, too. If you notice the tread is worn, or that a tire goes flat easily after filling it with air, have the tires replaced. Tires with little or no tread can make it hard for your car to stop suddenly on dry roads, yet bald tires on wet roads are even scarier. You’ll want to have well-maintained, reliable tires with tread when driving on slick roads during a thunderstorm, so it’s a good idea to at least have your tires looked at by a professional. Along with having a reliable set of tires, you’ll want to make sure your brakes are functioning properly. First, check your brake fluid and make sure it is at a good level. Does it have a milky color to it? If so, this could mean that water has gotten into the fluid which makes it less effective. Is the brake fluid dark in color? If it is, this is bad. If it is dark brown or black, it most likely hasn’t been changed in several years. Replace the brake fluid yourself or have a professional change it if it looks compromised. Next, inspect the brake pads and rotors, or take your vehicle in for a professional inspection. Failing or faulty brakes make your vehicle a risk that not only places you and your loved ones in danger, but also others on the road. Because your car probably worked overtime over the summer, it’s a good idea to check the health of your car battery. The last thing you want to happen is for your battery to die while you’re driving in an autumn thunderstorm. Inspect the battery for signs of corrosion. Using gloves and a baking soda and water solution, use a basting brush to clean corrosion from the battery and cables. Next, take your car to a local auto parts store and have them run a battery test (which is usually a free service) to see how much life your battery may have left. This can help you determine if you need to purchase a new or refurbished battery right away or in a few weeks or months. As the cooler weather settles in and cold fronts come and go here in San Angelo, you’ll want to make sure your heating vents and defroster is working properly. A rainstorm can make it easier for the windows to fog up, especially when there are multiple passengers riding in the vehicle. If your defroster isn’t working, you’ll have a harder time clearing those windows to improve visibility. Additionally, it’s no fun getting into a chilly car first thing in the morning, so make sure your vents are clean and free of leaves and other debris that can sometimes get caught in the fan and vent. Probably one of the most important ways to prepare your car for fall is by repairing or replacing the auto glass. Cooler weather, and those cold temperatures that occasionally accompany cold fronts here in West Texas, can cause chips and cracks in your windshield that can expand and even cause the glass to shatter. If your windshield incurred chips and cracks over the summer, it’s best to have them repaired to prevent further damage. For an expert windshield repair or auto glass replacement to get your car all ready for fall, contact West Texas Windshields, San Angelo’s Top Rated Local® auto glass experts, to schedule an appointment with one of our skilled windshield technicians. Our team of car window experts can repair or replace any windshield or auto glass, and will be happy to get you back on the road in safety. Call us today!